A wrought iron candle chandelier makes a dramatic statement in almost any room in your home. These structures, which were popular in the 17th century, come in a variety of shapes and styles, and are eye-catching additions to your home décor. What Is a Wrought Iron Candle Chandelier? Candle chandeliers have become common lighting accessories in many homes. They hang from the ceiling like a traditional chandelier, but instead of electric light they are illuminated by candles. These candles can be real wax candles, or battery-operated ones that require no open flame. A candle chandelier made from wrought iron features the well-known heft and dark color of a wrought iron fence. Accents like crystals and beads may be added for a more decorative look. These chandeliers are made for both indoor and outdoor use, since the iron is a material that can withstand almost all weather conditions. 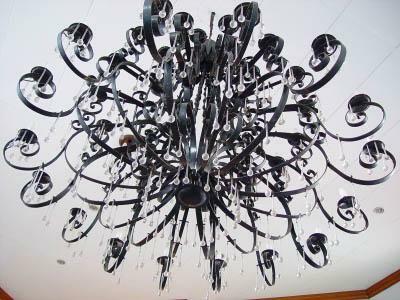 Wrought iron chandeliers are available in all price ranges, from affordable to very pricey. Professional interior decorators agree that every room, no matter what colors are used on the walls and accents, should have something black in it to ground everything else. Black accents draw and anchor the eye, bringing out the color scheme of the room. A black wrought iron chandelier will certainly add a wow factor to your dining room, living room, or bedroom. You can choose intricately scrolled and ornate designs, or a more simple, sleek look. Candle chandeliers provide subtle lighting and a warm glow. They can be fancy and formal, or simple and rustic. Since a candle chandelier made from wrought iron will be heavy, you'll have to take care to make sure it is well secured. If you aren't sure how to do this yourself, consult a professional to ensure the chandelier is safely installed before use. Dripless candles are by far a better choice than those that will melt and drip all over your furniture, floor, or even people or pets below. Hang the chandelier far enough down from the ceiling so that the candles will not cause any smoke or heat damage. Make sure there is a chair or step stool nearby for easy extinguishing. Always use a candle extinguisher to put out the flames so that you don't blow melted wax from the chandelier. Candle chandeliers look great outdoors, as long as you have a safe place to hang them from. Wrought iron is the perfect material for any outdoor candle holder, since inclement weather won't destroy them. Flameless candles work well outdoors, since a sudden gust of wind won't blow them out. Alternatively, look for candle chandeliers that use votives or tea lights inside glass holders to protect the flames from the elements. You can find wrought iron candle chandeliers at many home decorating stores or even some hardware stores. They are also available online, though you'll have to pay close attention to shipping costs because of their weight. Here are a few places to find them. Gallery 803 - This candle chandelier is very detailed and expensive, but it's also quite beautiful. 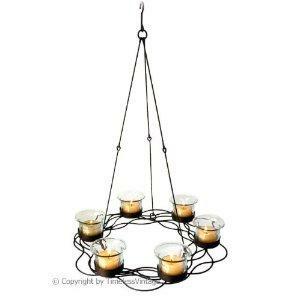 A Rustic Garden - These wrought iron chandeliers for candles are much more affordable and can be used indoors or outside. Amazon - This is a much sleeker design for indoor use, and the price is much lower than the fancier models. This candle chandelier holds taper candles. While the thought of using wrought iron for a chandelier might make you think of heavy, clunky lighting fixtures, modern designs are available that are much less gothic-looking. You can find candle chandeliers to suit any space inside or outside your home.